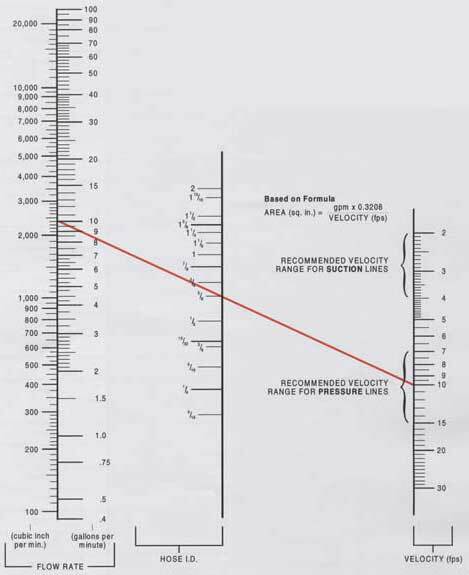 Determine the proper flow rate your system requires, then connect a straight edge from the selected flow rate to the recommended velocity range. The required hose I.D. will appear at the intersection of the straight edge and the centre column. If the straight edge passes through the scale between sizes listed, use the next larger I.D. hose. The flow rate your system requires is 10 galons per minute. Connect your straight edge from 10 gallon per minute flow rate column to the recommended velocity range for pressure lines of 10 feet per second (fps). The straight edge intersects at 5/8. so the recommended hose I.D. is 5/8".